British Museum: Vikings: Life and Legend The Vikings are coming! Live broadcast from London of the first major Vikings exhibition at the British Museum for over 30 years. The British Museum are filming in Clontarf with 600 Viking re-enactors reliving the Battle of Clontarf which took place 1000 years ago. The actual anniversary is April 23rd. 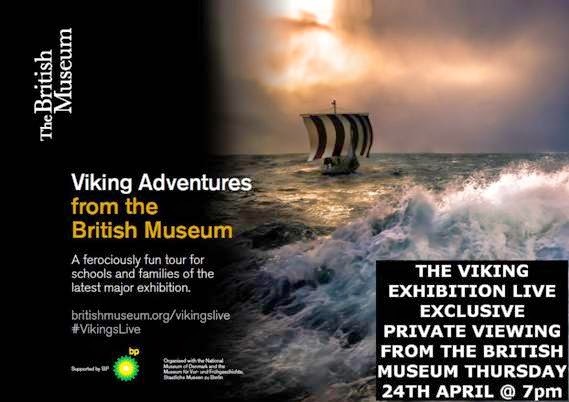 With demonstrations, stunning close-up photography of the Viking objects in the exhibition and a torch-lit burial in the grounds of the Museum, the broadcast of Vikings Live will be a reminder of how the Vikings have shaped our modern lives.